Workers pay dearly for health coverage in U.S.
Kingstons, owners of the Co-Op mine in Utah, file lawsuit in U.S. Federal Court against UMWA, 17 miners, the Utah AFL-CIO, AFSCME Council 6 in Utah, PACE international union, the National Organization for Women (NOW), Socialist Workers Party, Workers World Party, Roman Catholic Church, Jobs with Justice, the 'Militant' newspaper, the 'Salt Lake Tribune,' the 'Deseret Morning News,' the 'Sun Advocate,' and many other individuals and organizations who have backed the Co-Op miners' struggle to win representation by the United Mine Workers of America. Suit charges 120 defendants with "unfair labor practices" and "defamation." Read the legal brief. (click here). HAZLETON, PennsylvaniaSocialist Workers Party vice-presidential candidate Arrin Hawkins spoke before students in two classes at Bloomsburg University here September 17. She was invited to speak to the history classes by professor Walter Howard. Many working people around the country are reacting to speedup on the job, to brutally long work hours, to unsafe conditions and assaults on our dignity by the bosses in their drive for profits, Hawkins said. 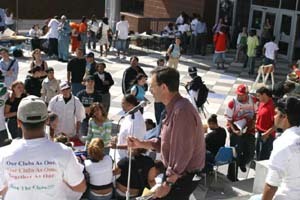 Hawkins said the Socialist Workers campaign offers a working-class alternative to the two major capitalist parties and other pro-capitalist candidates. I invite you to join with us in taking this campaign to other workers, farmers, and students, she said. The Bloomsburg University stop, which was attended by some 40 students and faculty, was part of a several-day campaign swing through this area by the Socialist Workers Party vice-presidential candidate. Hawkins joined other campaigners in talking to workers going in and out of the large Excel meatpacking plant in the area, getting the Militant, Perspectiva Mundial, and other socialist campaign literature into their hands. She was also part of the line-up of speakers at a September 18 public meeting in Hazleton to protest the September 11 firebombing of the SWP campaign headquarters there and of the White House Café, a Black-patronized restaurant in nearby Wilkes-Barre. In addition to the defense of the labor movement, Hawkinss exchange with students at Bloomsburg University focused on the other central demand put forward by the Socialist Workers candidates: supporting the efforts of nations oppressed by imperialism to raise the standard of living by expanding the electrification of their countries, including the use of nuclear energy, free from pressure and intervention by Washington and its imperialist cohorts. Hawkins said the change in immigration law proposed by the White House earlier this year should be opposed. This bill would allow undocumented immigrants who have jobs in the United States to apply for a temporary three-year work visa. They would be able to renew the permit, but would not receive special consideration for permanent resident status or citizenship. This legislation, if it is approved, would create a category of workers dependent on an employer to keep their legal status, Hawkins said. Its designed to allow the government to tighten its control over immigrants, making these workers subject to deportation once their visas expired and far more vulnerable to deportation in times of economic slowdown or depression. We demand an immediate end to workplace raids by immigration cops and deportations like the recent one in this part of the country that resulted in the arrests of workers at the T.J. Maxx warehouse, Hawkins emphasized. In spite of this, Hawkins said, the SWP presidential ticket is on the ballot in 13 states and the District of Columbia, the largest ballot effort by the socialists since 1992. Delaware is the only state where, in an undemocratic move, the SWP ballot submission was rejected by state authorities. Hawkins said the Socialist Workers Party opposes the undemocratic challenges to Naders ballot status. At the same time, Nader is a pro-capitalist politician who acts as a pressure group on the Democratic Party to somehow make this imperialist party more progressive. His American nationalist stance has led him to carry out maneuvers with the rightist Reform Party and to court backers of ultrarightist Patrick Buchanan, who recently authored an interview with Nader that appeared in the June 21 issue of the American Conservative. Some who advocate voting for the Democrats argue its necessary to defeat Bush at all cost, that is, to vote for Kerry, said Hawkins. But the only way to defeat the Bush agenda, as they put it, is to organize working people to fight for our interests independently of the twin capitalist parties. The SWP is providing a clear working-class alternative to the Democrats and Republicans and to this so-called independent candidacy of Nader and his running mate Peter Camejo, Hawkins said. A woman who approached the socialist candidate after the meeting said how much she appreciated the fact that Hawkins linked the dismantling of welfare by the Clinton administration with the mounting bipartisan campaign by the Democrats and Republicans to further gut the ability of those at retirement age to collect a federally funded and guaranteed monthly Social Security check. A number of students found the campaign literature interesting, purchasing the Militant and books the campaigners brought with them. In Pennsylvania the Socialist Workers Party is running Brian Taylor, a Pittsburgh-area coal miner, for U.S. Senate; Martha Ressler for Congress in the 14th Congressional District; Tim Mailhot for Congress in the 11th C.D. ; and Kristofer Barkanic for State Assembly in the 116th District. Mailhot spoke to a September 22 meeting of students at Bucknell University in Lewisburg. Campaigners in Pennsylvania are circulating a statement by Senatorial candidate Taylor solidarizing with the struggle by coal miners at Horizon Mines in West Virginia, Kentucky, and Illinois. It reads in part, Union brothers and sisters at Horizon Natural Resourcesmembers of United Mine Workers of America (UMWA)are under attack. Mine bosses and the courts that do their bidding, with a stroke of a pen, gave Horizon the right to declare bankruptcy and terminate the union contract. Retired and actively working minerssome with as much as 20-30 years senioritystand to lose the pensions they are entitled to and the lifetime medical coverage for themselves and their families! This union-busting government intervention is a direct assault on our right to organize unions to defend our wages and working conditions against the bosses attacks. Federal bankruptcy judge William Howard made his ruling on the basis that Horizons six union mines were an unattractive sale to potential buyers if they had the obligation to pay what is owed to the 3,300 miners.